Anyone here tried sugar waxing before? I am big fan of leg waxing but I never tried sugar waxing before - only reason that's holding me back from trying is I know that it will be much much painful that the regular waxing done at waxing salons. 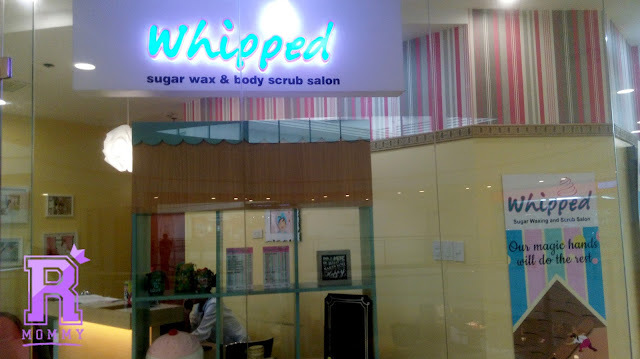 During an afternoon stroll at Ayala Fairview Terraces, I passed by Whipped and decided to try out their Caramel Scrub and Sugar Wax for half of my leg. I usually do full legs but the hair on my upper leg is still thin and barely noticeable. Since this is my first time doing this, I decided to interview and ask Ate Jane. She's the one who's going to do the sugar waxing on my legs. I asked her what are some of the benefits of sugar waxing and I was surprised that compared to the regular waxing I am used to, sugar waxing is by war the best option for my skin! Scrubbing rids of your skin's impurities and dead skin cells immediately. Evens out your skin tone by removing dark patches. Gives you a healthier and smooth skin. It's all natural and organic because it is made from Sugar, Water, and Lemon! Reduces chances of ingrown hair. Yuck! Less painful and and discomfort. Well, you have to experience this yourself first. Minimizes risk of hair breakage. The session basically will start from getting your legs sprayed with water - scrubbed - and waxed. Sugar Waxing... eerrr are you guys seeing my leg hair?! EEEWWW!!! You can check out Whipped Waxing salon here. Rookie Mommy PH - Thick hair? Don't care! Kebs! 1 comment on "Benefits of Scrubbing and Sugar Waxing"